Thank you to SDCAP for supporting “Our House, Your Canvas”, a project by The Normal House. 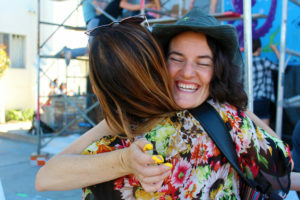 The Normal House is a small, intentional, co-housing community in the Normal Heights neighborhood of San Diego founded in the fall of 2012. 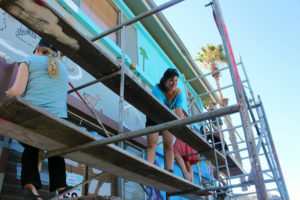 As part of Art Around Adams, a free event that showcases creative talent and businesses in Normal Heights, the community was invited to participate in mural painting on the front of the house. We were blown away by the community response, both during and after the painting. During Art Around Adams over 200 people picked up a paint brush and expressed their creativity. We had planned to stop painting at 7pm, but had to force the last people to leave close to midnight! 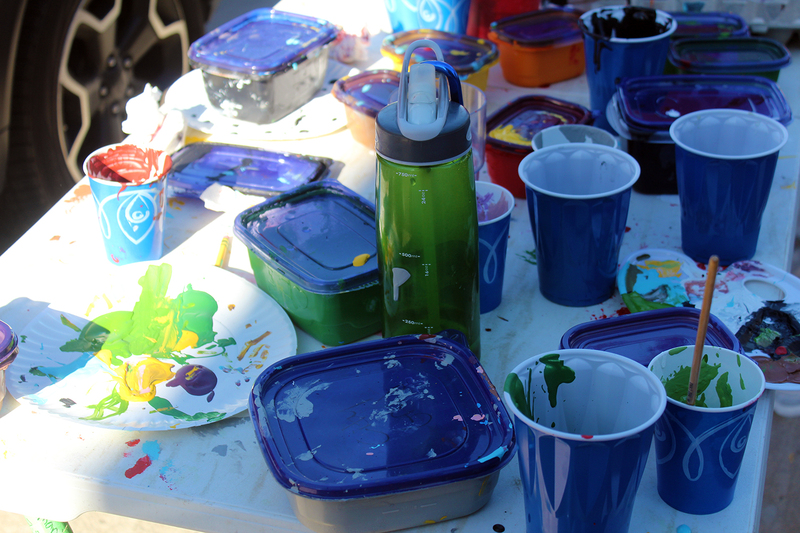 Then several people (strangers) came back the next day to ask if they could keep painting. An unexpected and wonderful outcome from this collaborative project is how it has affected the neighborhood. We finally met neighbors that we have lived near for years (the neighbors across the street came over to suggest we use some glow in the dark paints). People come to “visit” their painting, and show it off to friends. The response has been uniformly positive, and the neighborhood feels has a more interactive and creative spirit. MINUTES OF A MEETING of the Board of Directors of the Corporation (the “Board’) held on the 8th day of June, 2016 at 7:00 p.m. at Colab in San Diego, California. President Jemmott called the regular Board meeting to order at 7:03 PM. Board Members Present: Colin Jemmott, Cassy Haynes, Curt Benedetto, Paul McCarthy, Lisa Walden, Stephanie Cucurullo, Cable King, and Greg Davidson (Greg via Google Hangout & Phone). There was no discussion regarding the meeting minutes. ON MOTION DULY MADE BY PAUL MCCARTHY, SECONDED AND CARRIED, IT WAS RESOLVED THAT the minutes of the meeting of the Board held on 5/25/16 be approved. Secretary Cassy Haynes reported that she is working with the insurance company regarding securing cancellation insurance. Afterburn Report will completed by Fin and transmitted to BMORG ASAP. Colab Management met with Martin to create processes, etc. regarding use of CNC Router and classes. (a) Mini-Man 2.0 (Curt): Received 2 proposals (info sent to Board via email); Discussion of pro’s and cons of each proposal occurred. ON MOTION DULY MADE BY STEPH CUCURULLO, SECONDED AND CARRIED, IT WAS RESOLVED THAT subject to the execution and delivery of a contract setting forth the terms of the artwork and grant, SDCAP will give $4,066.20 and a donation letter for additional services rendered to Brock Ritchey, Wylie Wedly and Lindsey Lawlor for the design, construction and installation of Mini-Man 2.0. 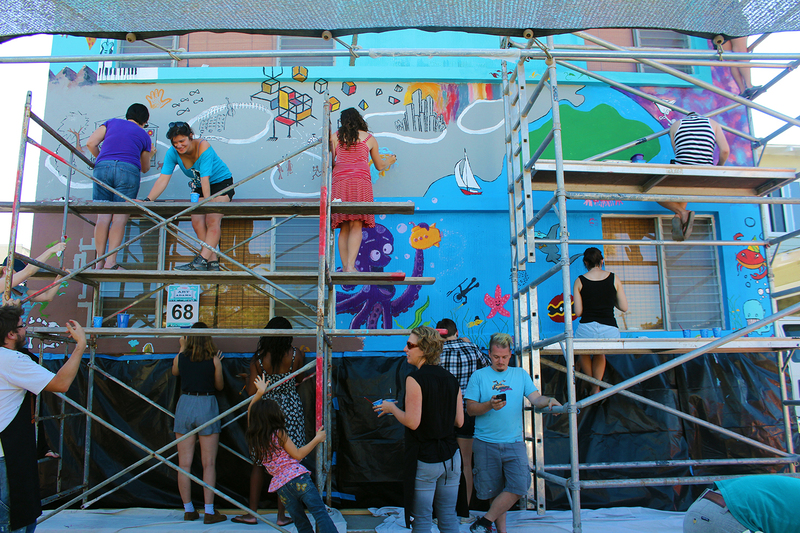 Mural on Normal House done by Normal Heights community at Art About Adams on 6/4/16. Sami circulated photos of the mural. Photos & description will be added to SDCAP website. 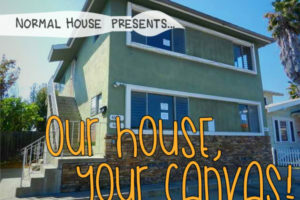 ON MOTION DULY MADE BY STEPHANIE CUCURULLO, SECONDED AND CARRIED*, IT WAS RESOLVED THAT, subject to the Normal House’s donation of paint to SDCAP, SDCAP will give $266 to the Normal House for the mural project. Curt and Lisa will reach out to artists which agreed to donate artwork for Kickstarter campaign. Kickstarter campaign will launch on 6/15/16. Cable King presented proposal for San Diego Burning Man contingent in the 2016 San Diego Pride Parade. Requested $1,480 as a budget for float, decorations, etc. This year the contingent is entering a float in the parade in addition to walkers, hoopers, bikers and circus performers. 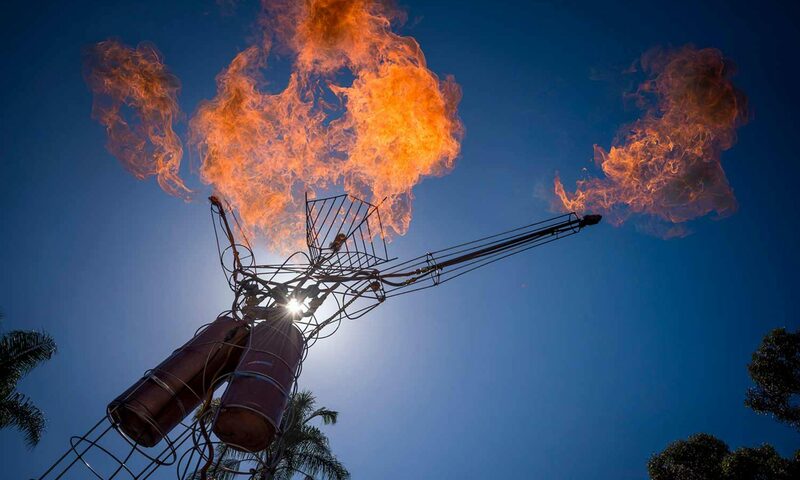 Last year’s participation by the SD Burning Man community strong, especially given weather conditions. Did not include schwag to gift people in original budget; requested additional funding ($200). ON MOTION DULY MADE BY JAKE HOLLER, SECONDED AND CARRIED*, IT WAS RESOLVED THAT SDCAP will give $1,680.00 to the Pride Parade Committee for the San Diego Burning Man contingent and float in the 2016 San Diego Pride Parade. Paul suggested SDCAP commence Youtopia Producer selection process ASAP. Minor discussion regarding potential process occurred. Colin requested that Board members create proposal to present to Board for criteria/process Producer selection. There being no further business, ON MOTION DULY MADE, SECONDED AND CARRIED, the meeting was adjourned at 9:08 PM. MINUTES OF A MEETING of the Board of Directors of the Corporation (the “Board’) held on the 25th day of May, 2016 at 7:00 p.m. at Colab in San Diego, California. As regular Board meetings do not require notice to the Board pursuant to the Corporation’s Bylaws, President Colin Jemmott acted as Chairman of the meeting. President Jemmott called the regular Board meeting to order at 7:00 PM. Board Members Present: Colin Jemmott, Curt Benedetto, Paul McCarthy, Lisa Walden, Stephanie Cucurullo, Cable King, Dominic Moretto, and Greg Davidson. ON MOTION DULY MADE BY PAUL MCCARTHY, SECONDED AND CARRIED, IT WAS RESOLVED THAT the minutes of the meeting of the Board held on 5/11/16 be approved. Treasurer Cable King emailed Treasury Report to Board members prior to meeting. Cable met with Christina Hebert (CPA) and signed forms for annual filing. As Secretary Cassy Haynes was not in attendance, President Jemmott assumed responsibility for recording the meeting. (a) Pottery Studio (Christian): Board asked Christian to scale back proposal, get clear buy in from Colab. Colab does not want to be responsible for tools. Christian has scaled it back to ~$3,000. Colab invited Board members and Community members to the meeting tomorrow to discuss. (b) Mini-Man 2.0 (Curt): Deadline on Sunday, nothing submitted yet, but expecting applications. (c) CNC Router (Martin): Martin presented slides and much discussion occurred. Board expressed concerns re: dust with glass shop, insurance, scheduling, maintenance payment method. A Gofundme was suggested to gauge community interest. Fundraising efforts are mandatory, though no minimum required, and will to refund SDCAP and colab. ON MOTION DULY MADE BY CURT BENEDETTO, SECONDED AND CARRIED, IT WAS RESOLVED THAT SDCAP will give $5,500 for the CNC router as proposed by Martin. The amount of the art grant shall be allocated between SDCAP’s Colab tool budget ($2,000), SDCAP’s art grant budget ($2,000), and from Youtopia art grants ($1500), pending approval from Colab and Youtopia. There being no further business, ON MOTION DULY MADE, SECONDED AND CARRIED, the meeting was adjourned at 9:00 PM. MINUTES OF A MEETING of the Board of Directors (of the Corporation (the “Board’) held on the 11th day of May, 2016 at 7:00 p.m. at Colab in San Diego, California. President Jemmott called the regular Board meeting to order at 7:05 PM. Board Members Present: Colin Jemmott, Cassy Haynes, Curt Benedetto, Paul McCarthy, Lisa Walden, Stephanie Cucurullo, Cable King, Jake Holler, Dominic Moretto (via phone, left mtg @ 8:59), and Greg Davidson (via phone arrived at 7:15, left mtg @ 9:05). Community Members Present: Christian Moffat, Bobby Marino, Sean Nash, Meg King, Jon Ray, Jackel, Martin, and Laura Lyndsey. There was discussion regarding the new meeting minutes format, which was unanimously approved along with the contents of the 4/27/16 meeting minutes. ON MOTION DULY MADE BY CURT BENEDETTO, SECONDED AND CARRIED, IT WAS RESOLVED THAT the minutes of the meeting of the Board held on 4/27/16 be approved. President Jemmott discussed annual forms which must be executed by Board members. President Jemmott will email forms to each Board member to print, sign and bring to 5/25/16 meeting. President Jemmott encouraged Board members to sign up for Slack. President Jemmott requested bios from Board members that have not yet submitted theirs so that they can be included on the SDCAP.org website. Treasurer Cable King emailed Treasury Report to Board members prior to meeting. Paperwork to include Curt Benedetto on bank accounts were mailed to bank. ON MOTION DULY MADE BY STEPHANIE CUCURULLO, SECONDED AND CARRIED, IT WAS RESOLVED THAT the 2016 SDCAP budget be approved. Cassy posed several questions regarding policy, annual paperwork and procedure to the Board. Board to request that Dean turn over all documentation in his possession to Cassy relating to his duties with SDCAP. Stephanie and Cassy will work together to address questions posed by Cassy with regard to contract execution and registered agent for SDCAP. Cassy agreed to take on responsibility to pick up mail and the annual documentation that is to be executed by Board members. Stephanie agreed to set up a finance committee with Cable and Jake to address financial controls as it relates to check issuance. Jake and Jon Ray spoke regarding the status of Youtopia and Youtopia budget. ON MOTION DULY MADE BY STEPHANIE CUCURULLO, SECONDED AND CARRIED, IT WAS RESOLVED THAT the 2016 Youtopia budget be approved. Glass shop is popular; $500 worth of vinyl windows donated by Tiny House team; Board reemphasized that drinking and working with tools is absolutely prohibited. Colab management agreed and stated that the policy is being strictly enforced. Camp Triptych (Laura) and Youtopia Safety Hub (Meg) proposed that SDCAP fund CPR and Safety Training classes at Colab. Laura and Meg proposed 2 different options. Pottery Studio: Christian Moffat submitted his proposal for funds to bring a Pottery Studio to Colab. Christian will work on budget and collaborate with Colab management and re-submit proposal to Board at a later date. Mini-Man: Curt discussed need for new Mini-Man to sit atop Colab. Suggested that SDCAP announce it to community and request proposals. Curt will manage project. There being no further business, ON MOTION DULY MADE, SECONDED AND CARRIED, the meeting was adjourned at 9:13 PM.